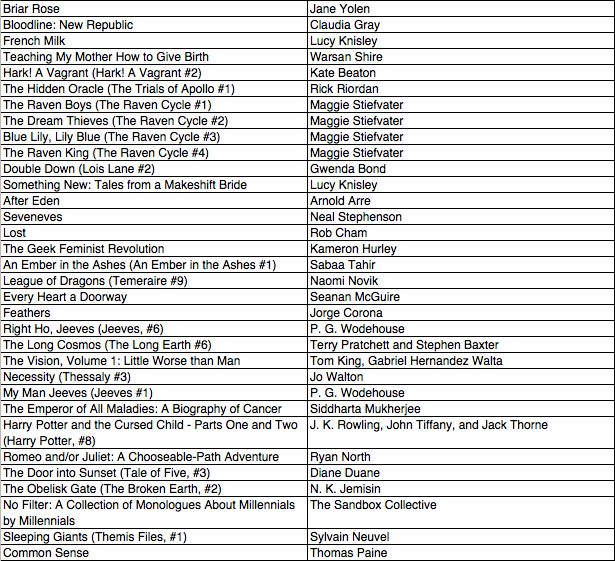 So this year, I didn't bookblog at all. But that doesn't mean I didn't read anything (thank goodness). I want to do SIX things with this blog post: 1) show my Top 10 for 2016, 2) discuss my reading data for 2016, 3) compare my 2016 reading data with the preceding years' data, 4) discuss any trends that may have arisen from doing 3), 5) check whether I've accomplished my 2016 reading resolutions, and, finally, 6) talk about my 2017 reading resolutions. It's all going to be relatively informal, so please bear with me. 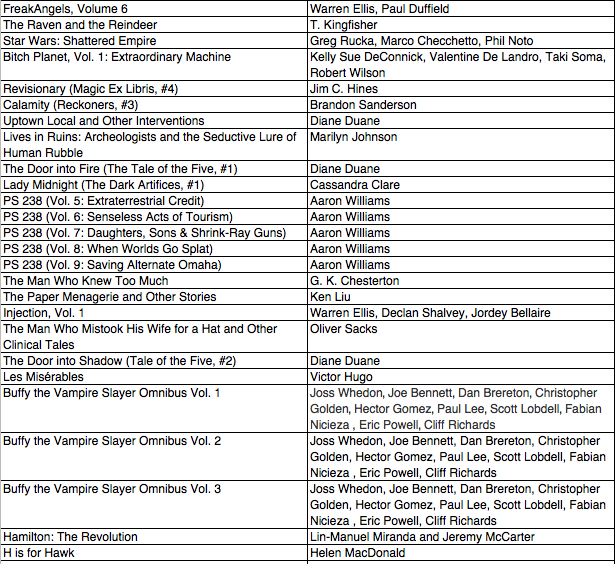 Okay, pretty pictures over, time to show the 112 books I read this year. I used to include a massive mosaic of the covers of those books, but this year I just can't be bothered to fire up Photoshop and painstakingly organise the images on layers. 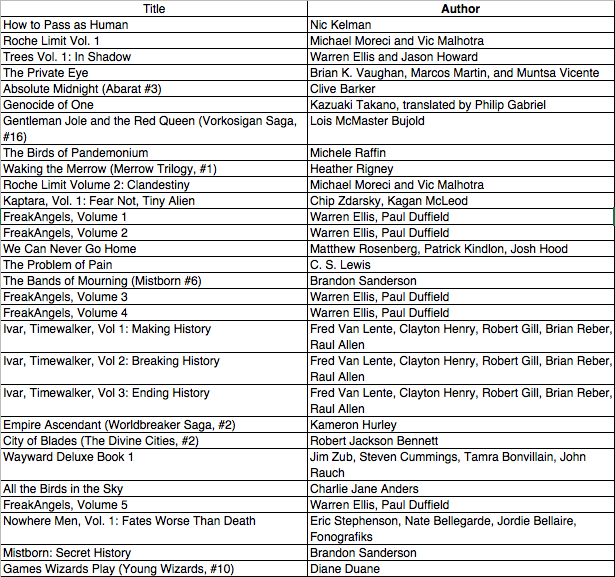 So everyone'll just have to read the list in Table 1 if they're interested in finding out exactly what I've read. I've got a Goodreads account in case any of you want to poke through the books and see how I liked each of them. I recommend going through the list according to Date Read as that'll correspond better with the list in Table 1. Table 1. 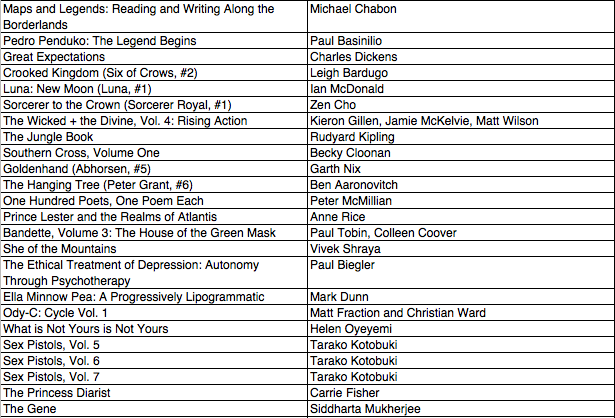 List of books read in 2016, arranged according to the date read. In Figure 1 (below) you can see the 12 groupings that I've used to organise what I've read this year. The groupings are totally qualitative, as I made categories based on what I deemed important to me, and also in hindsight, where I noticed that my reading tended to fall under these categories. Three of them, namely Begun, Continued, and Finished are actually sub-groupings under Part of a Series; those groupings will be addressed further later on in this blog post. 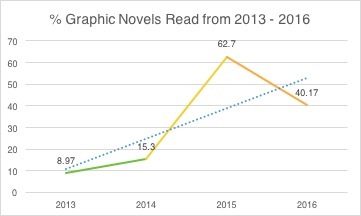 Graphic refers to graphic novels and comics, while Next 20s refers to books I've read from my immediate reading list. The remaining categories are self-explanatory. Quite a few of these categories overlap. Goldenhand by Garth Nix, published in 2016, is a New Release. 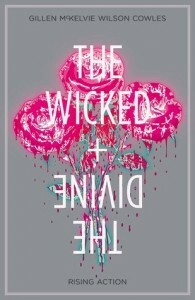 It belongs to the Fantasy genre, and is marketed as YA. 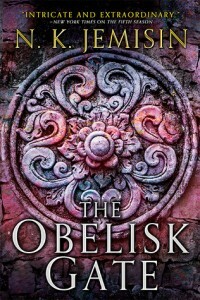 It is also the fifth, but not final, book in the Abhorsen series, making it Part of a Series, Continued. Figure 1. 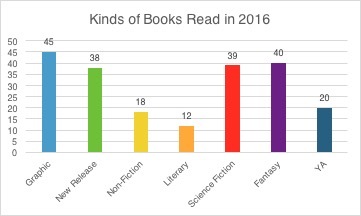 L: Table with number of books read in 2016, organised according to categories, with percentages on the right. R: Kinds of books read in 2016. Numbers above each column reflect raw numbers, not percentages. 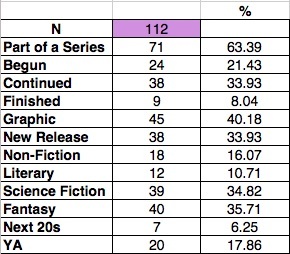 The category with the highest number of books read is Part of a Series, 71 (63.39%), while the one with the lowest number is Next 20s, 9 (8.04%). 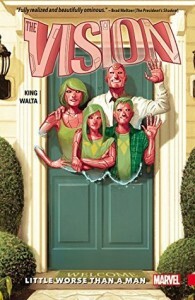 40.18% of the books read in 2016 were Graphic novels, and 35.71% were Fantasy. This is, of course, easier to visualise with the chart on the right. You'll note that Part of Series and associated subcategories are not included in this chart. If you aren't in the mood to read the table on the left, just look at the pretty colours on the right and say ooooh, aaaahhh. The reason I didn't include Part of a Series in the column chart above is that I want to show it separately and give it more focus. Figure 2. 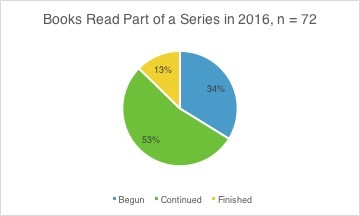 Pie chart showing data about series I read in 2016. In 2016, I read 72 books that were part of a series. I started 24 new series this year and finished only 9. I continued 38 series; a lot of books from series I've been reading were released this year, Young Wizards, Rivers of London, and Mistborn, to name just three of those 38 books. I hear that even more are being continued in 2017, but I'm actually hoping to put more series to bed and increase the number of books in the Finished sub-category. Figure 3. L: Line graph showing the number of books read per month in 2016. 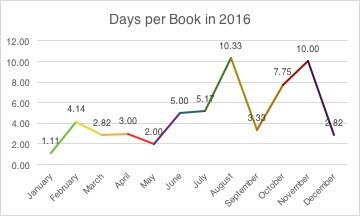 R: Line graph showing my rate of reading in 2016, values reflect days needed to finish a book in a month. I read 112 books in 2016, but if you look at the figure above (L), you'll see that I actually read the most in January (28). I knocked a lot of books out when I was taking care of my grandmother in the hospital that month since I had to stay awake all night. January also has the fastest reading rate with 1.11 days per book (R). The first and second highest number of books read are in January and May, both the first months of the second and third school term, meaning that I had more free time to devote to reading for pleasure. One can see that the number of books read drops further below the trendline as each term continues. February is an outlier, however, as it is shorter than the other months. 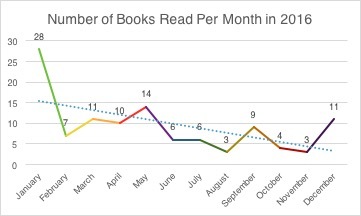 Conversely, the months with the lowest number of books read have the slower reading rates of 10.33 and 10.00 in August and November respectively. I started my PhD prep in August so you can see the number of books read decline even further before a small peak in the beginning of my first term as a PhD student, and everything goes downhill after that. :))) My reading rate recovered in December because I made an active effort to get back on that horse as soon as the term ended. While I did manage to successfully finish my Goodreads Reading Challenge this 2016, with 112 out of the 100 I pledged, this is actually the least number of books I've read in the past four years. Figure 4. 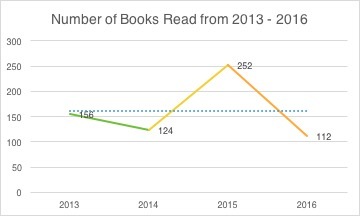 L: Column graph showing the number of books read from 2013 - 2016. 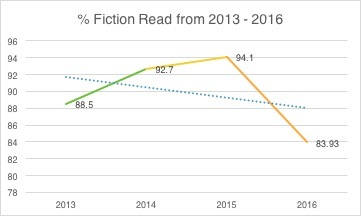 R: Line graph showing the trend of books read from 2013 to 2016. 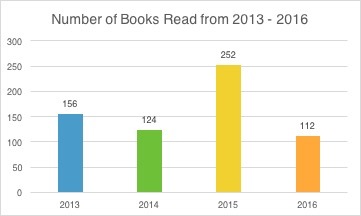 The highest number of books I've read in the past four years is 252 in 2015, followed by 156 in 2013. Before I plotted the data in a line graph (R), I had actually assumed that the trendline would show a decline, but apparently the high number of 2015 was able to yank everything up and show a mostly stable trendline. I was pretty depressed in the latter end of 2015 and I self-medicated with fiction. 2016 saw me getting help and taking actual medication, so I was able to spread my energy out a bit more and use it for more productive means. But I have to admit that starting my PhD was probably the biggest factor in kneecapping my reading in 2016. Now, that I've discussed the general aspects of my 2016 Reading Data, and have begun to compare it with the preceding years, I will now move on to the trends exhibited across categories from 2013 - 2016. Table 2. Table with number of books read from 2013 - 2016, arranged according to categories (%). If you're not in the mood to read a table, please feel free to look at Figure 5 and 6 instead. Figure 5. 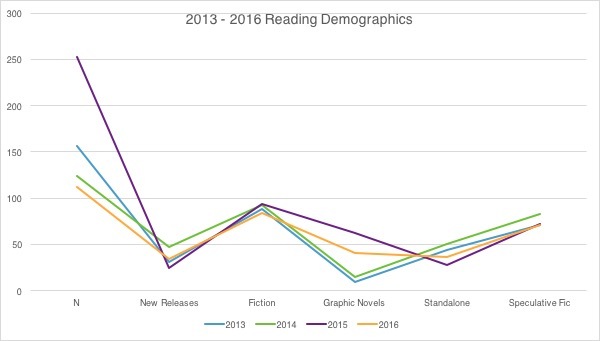 Line graphs showing 2013 - 2016 Reading Demographics. In Figure 5, above, 2013 to 2016 reading data are shown with overlapping lines. I didn't include the values of each data point as they overlapped in such a way as to render everything illegible. I was considering showing this as a column graph instead, but it didn't show the trend as clearly as I wanted to. In this case, the trend I'm referring to is the shape of the line across categories, which is generally similar, which means I have specific reading habits that I maintain from year to year. In Figure 6, below, actual trendlines are used and you can see how three of the lines, 2013, 2014, and 2016, are similar; the way 2015's line deviates is likely due to the high N in that year. Figure 6. Line graphs showing 2013 - 2016 Reading Demographics with trendlines. 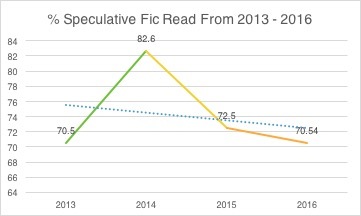 The trendlines of New Releases, Speculative Fiction Read, and Fiction read are all declining, despite the high percentage for Fiction read in 2015 (Figure 7, below). 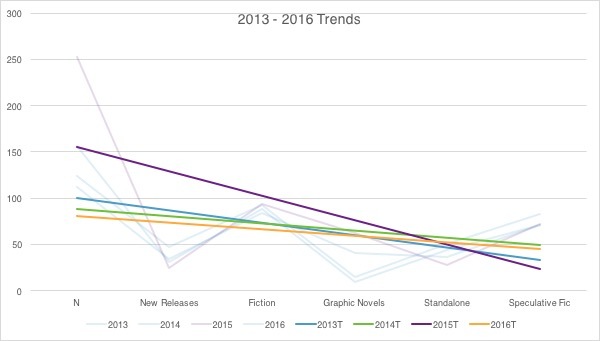 The only upward trending line graph is that of Graphic Novels where 2015 and 2016 have much higher percentages than the first two years. Figure 7. Line graphs of specific categories from 2013 - 2016. Have non-fiction comprise a larger portion of my total reads for the year. Finish Les Misérables by Victor Hugo because SERIOUSLY, I have been reading it on and off for some years now, and I swore to a friend that I'd finish it this year, but with them went my motivation to do it. This year! 1. Have non-fiction comprise a larger portion of my total reads for the year. Figure 8. 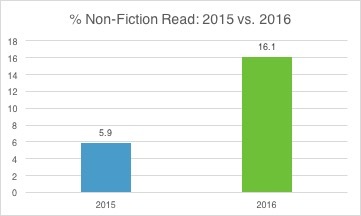 Column graph comparing the percentage of non-fiction read in 2015 and in 2016. 2. 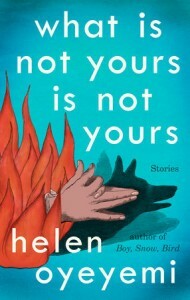 Read more literary fiction. 3. 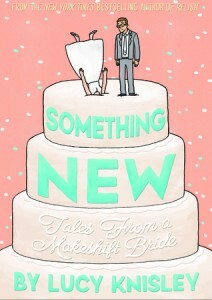 Read more standalone novels. Figure 9. 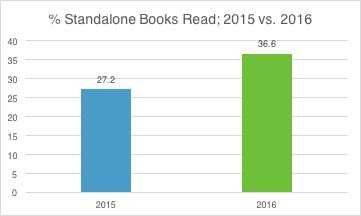 Column graph comparing the percentage of standalone books read in 2015 and in 2016. In 2016, 36.6% of the books I read were not part of series, while in 2015, only 27.2% were standalone books. ACHIEVED! 4. Finish Les Misérables by Victor Hugo because SERIOUSLY, I have been reading it on and off for some years now, and I swore to a friend that I'd finish it this year, but with them went my motivation to do it. This year! Figure 10. Screencap from Goodreads showing when that Les Misérables was finished. 5. Knock at least twenty books off my to-read list. I only read 7 books from my Next 20s list. So that was NOT ACHIEVED. I achieved 3 out of 5 of my 2016 Reading Resolutions! Not bad, if I do say so myself. 1. Continue to read more standalone books and non-fiction. 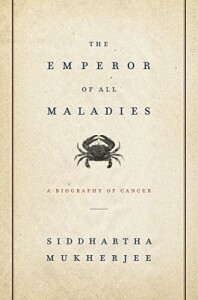 I really feel as though reading more non-fiction was pretty good for me. 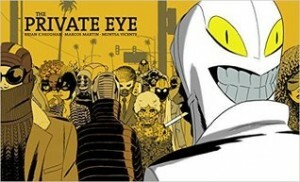 The amount of series I'm following is staggering and I would like to not add more ongoing series to that. 2. 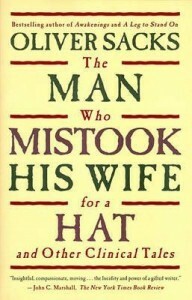 Read more literary novels! 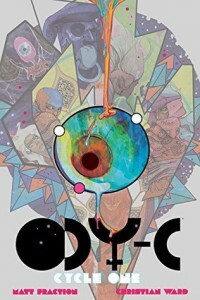 I've generally read more spec fic in my life, so there are gaps in my reading of the literary canon. I've been trying to fill those gaps lately, and the Serial Reader app has been helping me do that. That app cuts up large and usually unwieldy books into bite-sized pieces you can consume a little a day. You can end up lingering over a truly long book for a month and a half though, and I've found that I usually get so impatient that I just power through the remaining chapters in one go instead of waiting for the daily chapters. 3. 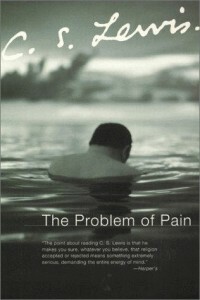 Book blog at least once a month. Book blogging really helps me organise my thoughts about what I've read and really ruminate about what a book means to me. It's really great because, even though it takes a lot of time, it sharpens my reading comprehension and analysis abilities. Both of which, of course, are very important in my field of research. I've been using a bullet journal for the past three or so months. I've found that it's a really relaxed system for organising my life, and I'm hoping that using my Bujo for my reading will help me get more done more easily. And I'm sure that I'll have some very beautiful layouts and modules to look forward to. PHEW, THAT WAS A LOT TO GET THROUGH. Thank you for bearing with me if you've gotten this far. In conclusion, I read less in 2016, with my reading rate ranging from 1.11 to 10.33 days per book, but I accomplished 3/5 of my reading resolutions. My reading habits have remained generally similar from 2013 to 2016, with the exception of a rise in the number of graphic novels read. I don't think that I should pressure myself to read more, as I have quite enough pressure in my life, and should just let these things happen organically. I'm excited to find out what I'll be reading in 2017, and I hope that the data I'll get in that year will be exciting.